Proper roof care is an often overlooked area of inspection and maintenance. Little problems, if left unchecked, can results in costly, destructive damage. 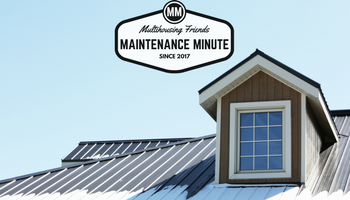 This week’s maintenance minute focuses on 3 ways to properly care for your roof! Rooftop debris can cause severe structural damage to your roof and is one of the leading causes of leaks and mold. For example, if gutters are clogged with leaves, branches or other debris rainwater can get backed up on the roof and cause water damage. Regularly clean out the gutters, remove debris from the rooftop and trim trees that hang directly over your roof. A fallen tree branch could penetrate parts of the roof that are not well reinforced. Especially in the blistering Arizona sun, your attics need proper ventilation. Consistently high temperatures could weaken and even damage your property’s roofs. Lyons Roofing, an AMA-Approved Vendor, recommends installing a solar attic fan because they “do an excellent job to pull this hot air outward and promote proper ventilation, reducing the strain on your roof and fighting mold-causing moisture.” Find out how to install a solar attic fan here! As a general recommendation, personally inspect your roofs twice a year — during the fall and again in the spring. Check to see if any shingles are damaged, missing, or curled. Any of said conditions could result in structural and/or water damage, so it is imperative to quickly replace damaged shingles. In addition to your own personal roof inspections, a qualified professional should generally inspect your roofs every 3 years. Fortunately, you can hire any number of AMA-Approved roofing experts to assist you with all of your roofing needs by visiting our Vendor Directory!